After I got the antenna back up, I measured the angles and computed the lengths of the sides. Ideally, it would be a square. Hey—after lots of motorcycle posts, here’s one on ham radio. Argh! I have an 80-meter full-wavelength horizontal loop antenna and it came down in some recent winds. It’s fed atop my roof on a short mast, which also holds up a 2-meter-and-up discone. I feed the loop with ladder line and use an antenna tuner. Well, I can’t claim to be the best antenna technician. I just threw some chunks of wood over trees using white nylon parachute cord and yanked the corners of the antenna up that way. The constant chafing of one of the trees on the cord finally frazzled the cord into nothing, and down it came. So, I rejiggered the corner insulator locations and got it up again (more chunks of firewood over trees). 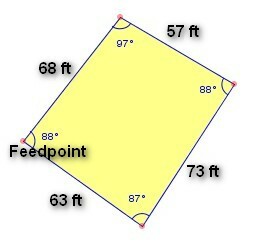 Just for kicks, I thought I’d do some measurements to see how close to a square I came. The answer is a lot closer than I expected. I used a nifty tool at mathopenref.com to create a drawing with the angles right, then got out my ruler and calculator to figure the side lengths. All around, not too bad, considering what I have to work with as far as antenna mounting points. The whole thing slopes down to the east, so I suppose that affects the radiation pattern. I originally put it up for NVIS local communications, and it works well for that when conditions are good, but it also works on all bands with a tuner. It’s been my main HF antenna for some time now, and it looks like it will continue in that capacity. I really do wish I had some real poles for the corners. I’d love to create a 160-meter full-wavelength loop. I have a acre here, so it would fit if I had something to hold it up. I am attempting to build my first hf antenna. I have built a 9:1 balun, and have about 40′ of yard to work with. was thinking of running a 12 ga. wire about 34′ then adding a 127 turned 16 ga. wire around an 1.25” pvc pipe to make a coil to add for 80 meters and a 6′ wire or so to make the 40 ‘ I have. was going to put this about 30’ in the air. if so maybe could make it into an inverted “L” ? do you think this project could work? I am in the process of building my own HF antenna. I too chose to use fence top rail. However, I wanted something sturdier so I could go higher. Home Depot carries only 10 ft sections and Lowe’s carries some 20 footers. The price for heavy gauge 20 footers was around 90 dollars. I located a fencing supply company and found 2″ diameter 20 footers for $36! These don’t have sweged ends so they use a ‘sleeve’. I plan to use self-tapping screws to lock down the joints. Check out your local chain link fence supply company.